Did you know that realtor.com recently named Albany as one of the 10 places favored by young homeowners to settle down and call home? With an increasing number of tech jobs becoming available and a thriving night-life, people are learning what many of us already know. Albany is a great place to be. As a 6-time GM Dealer of the Year award-winner, DePaula Chevrolet is Albany-proud and has been since 1985. Committed to offering our customers the best variety of cars for sale in the Albany area, our inventory is only part of what sets us apart. We enhance our customer experience through our transparency of pricing, and our dedication to creating a buying experience designed around you. After all, your lifestyle, needs and tastes are unique. Your car buying experience should be, as well. At DePaula.com we aim to empower potential car buyers with the information needed to buy with confidence. For each of the hundreds of cars available on our lot, we offer full online profiles which include a full array of manufacturer specs, warranty summary, added features, a photo gallery, and even video introductions specific to the vehicle you may be interested in. What better way to introduce you to your next vehicle? In addition, we invite you to use our Shopping Tools to help value your trade-in, schedule your test-drive and calculate your payment before coming to visit us in person. With the ability to apply for financing online, DePaula aims to be more respectful of your time. After all, you have better things to do than spend half your day here – let us help you to get further in your journey. Finding the right vehicle for your lifestyle shouldn’t be a challenge. At DePaula, we guarantee that finding the right Chevy for your lifestyle won’t be. Whether you’re in the market for a car, SUV or truck we have what you’re looking for – and can help you find the trim option that will personalize your new vehicle perfectly for you. Chevy offers a number of economical car options beginning with the Spark, a tech-savvy four-seater built for urban life, and designed with flair. Starting at $13,000 MSRP, it’s an affordable daily driver with a 38 highway mpg. 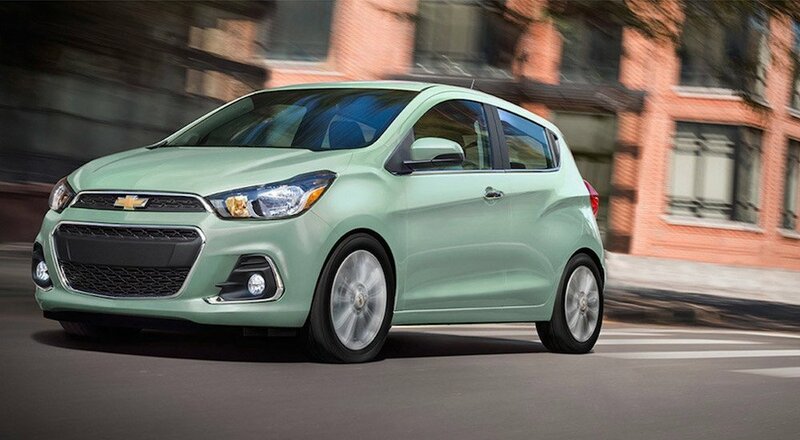 Offering the same fuel economy, the Sonic is priced to start at $15,145 and is available as both a sedan or hatchback. Serving up a surprising amount of cargo space, it is a more versatile option, ready to tackle the demands of daily life. This mindset is further evolved in the Cruze, which offers a sportier look with trim options that can create a high-end appearance and feel starting at $16,975. With up to 40 highway MPG it earns a Top Pick from Consumer Reports, making it worth a second look, for sure. At $21,680 to start, the Malibu remains a perfect translation of Chevy’s design initiatives within the sedan class. Finally, the Impala takes all of this to the limit; beginning at $27,500, it earns the title of “Best Large Car For The Money” and garners another Consumer Reports Top Pick. If your new Chevy needs to accommodate a family, an active lifestyle, or if you want the versatility of an All-Wheel Drive vehicle, you may be in the market for a Crossover / SUV. Depending on your needs, Chevy serves up a brilliant range of offerings from the sporty to the spacious. At $21,000 (MSRP), the Trax kicks off these offerings with an estimated 33 highway mpg courtesy of a 1.4-liter Ecotec turbo engine. Sporty and spirited, it’s a great introduction to Chevy SUVs for those whose lifestyle may not demand everything that an SUV can offer. Starting at $23,580 the versatile Equinox delivers 40 mpg in a perfect package of style, technology, performance, and safety. With seating for up to 8, the Traverse serves up 22 highway mpg, and 5,200 LBS of towing capacity – courtesy of a 3.6L V6 pumping out 288 hp. At $47,215, the Tahoe is J.D Power & Associate’s “Most Dependable Large SUV” with a Best-In-Class 23 highway mpg. Cranking out 355 hp courtesy of a 5.3-liter V8, it blends performance and luxury. Not to be outdone, the Suburban sits atop the offerings starting at $49,915 and marrying truck versatility, luxury amenities, and a 8,300 LB towing capacity when properly equipped. And if you’re looking to explore exclusively eco-friendly options, we can help. The hybrid Chevy Volt can deliver up to 420 miles with a full charge and full tank of gas. With regular charging a Volt driver can expect as much as 1,000 miles between fill-ups! The fully-electric Bolt EV delivers an EPA-estimated 238 miles per charge. If your daily commute falls within the average of 40 miles round-trip, you could go 3-4 days without a charge! But which is right for you? Only you can decide. One of the most exciting developments in Chevy’s offerings is the evolving technology features, present (or optional) in all of the above! Connectivity has never been more important and Chevy has addressed this by including a built-in 4G LTE Wi-Fi hotspot, which can accommodate up to 7 devices! Add in compatibility with Bluetooth, Apple Car play and Android Auto services, and it’s easy for all drivers to maintain a seamless connection with their Chevy. This is taken a step further with the myChevrolet app, which transforms your mobile device into a command center for your vehicle: able to control door locks and engine function, among others.